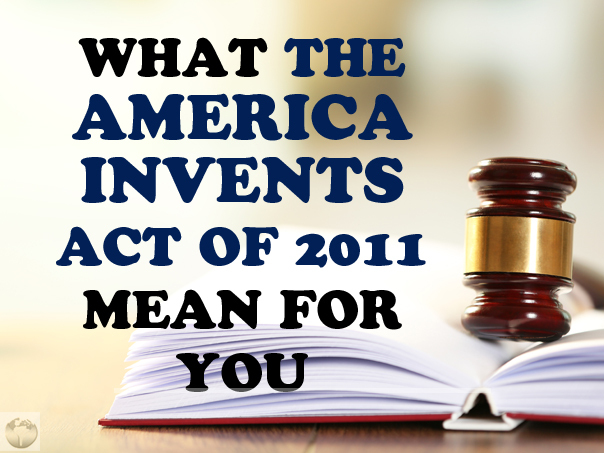 In 2011, President Barak Obama signed into law the America Invents Act, which included provisions that bring American patent laws into compliance with international standards. At this point, all aspects of the law are fully in effect, and whether you�re starting out or simply haven�t been paying attention to changes in the last few years, there are a few changes to patent laws that you need to know about. the fact that the United States is now a �first to file� nation instead of �first to invent.� Before March 16, 2013, if you invented something first and you could prove that you invented it first, then you could cancel any patent issued by someone else. However, while this system was fair to the original inventor, it caused a lot of complicated legal battles since not everyone is thinking about �first to invent� laws as they�re in the middle of perfecting a prototype. On top of that, the fact that many people are often involved in designing a single invention only complicated matters further. Under the �first to file� laws, anyone involved in designing a new invention can file, even if that person created it separately and later than you, which makes the government�s job easier. It also encourages people to file patents instead of keeping their inventions trade secrets, which is also good so far as the government is concerned. As a result, it�s more important now than ever before to file as soon as you reasonable can. Thanks to the AIA, there is now an additional fee for using paper to file your patent instead of filing electronically. Previously, the USPTO had different fees in place for regular entities and �small� entities, in other words a small business or an individual. For the most part, small entities only have to pay half of what a large company or a wealthy individual has to. Now the AIA has added the �micro� entity class, which is a small entity which doesn�t make more than three times the median household income, which hasn�t filed more than four previous patents, and which isn�t obligated to pass the patent on to a larger entity. If you qualify for micro entity status � and most independent inventors do � then your USPTO fees are cut down to 25 percent instead of 50. Intellectual property journalists are calling the AIA the biggest change to patent law since 1952, so it�s important to keep track of what all has changed. If you�ve been out of the loop in the past few years, it�s past time for you to get reacquainted.